The emergence of private space corporations with ambitions beyond low-Earth orbit gives hope to humanity because they can focus solely on space exploration and development and are not limited by foolish bureaucratic procedures like government agencies are. A lot of private space companies have sprung up over the years, but one company's ambitions promise to push humanity further than we have ever gone before - to Mars and beyond. Space Exploration Technology (SpaceX), founder and CEO, Elon Musk has made it his company's goal to send a manned mission to Mars in the next ten to twenty years. If any space company can walk the talk it is SpaceX. They have developed the Falcon Heavy Rocket, the world's most powerful rocket, which can lift over twice as much as the closest vehicle, the recently retired US Space Shuttle. SpaceX is currently contracted with the United States government to resupply the International Space Station following a final test in November of 2011. The predecessor to the Falcon Heavy Rocket, the Falcon 9 has proven capability to transport supplies to Low Earth Orbiit. SpaceX will be able to modify the Falcon Heavy Rocket so that it can send massive payloads to Mars. The Falcon Heavy Rocket is not SpaceX's only innovation; they have also developed a Dragon Spacecraft that with slight modifications will be able to transport humans on interplanetary missions. 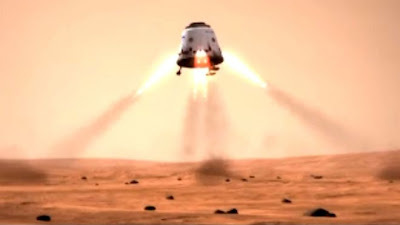 When launched with the modified Falcon Heavy Rocket, the manned Dragon Spacecraft will be able to touch down on Mars. The prerequisite to this manned mission to Mars is already in the works. SpaceX has been cooperating with NASA to plan an unmanned mission to Mars using both the Falcon Heavy Rocket and Dragon Spacecraft. This mission, informally called the Red Dragon Mission, would land a large rover on Mars equipped with a drill, among other things, to investigate what lies beneath the Martian surface ice. The mission would be less than one-fifth of the $2.5 Billion Mars Science Laboratory Mission, set to launch in November of 2011, but would deliver a much heavier payload. While further tests have to be conducted the Red Dragon mission to Mars will likely occur within the next decade. The biggest problem any private space company faces is a lack of funding because it costs a lot of money to develop and explore space and the government is less than reliable when it comes to funding for space projects. The good thing is that SpaceX's Falcon Heavy Rocket can deliver twice the payload of its closest competitor at a third of the cost, thus saving the government over a billion dollars a year. Even is government funding falls through there are other, less traditional means of securing funds for manned exploration of Mars, but I'll save that for another article on a different day. Space travel and exploration is not at an end, it has just turned a corner. The proven capability of SpaceX, combined with their ambition will ultimately put man on Mars and set a precedent for future Mars travel and manned exploration. The future of space exploration is in the hands of ambitious companies like SpaceX whose sole focus is space development and exploration. Hopefully SpaceX can achieve their stated goal of setting a man on Mars in the next 10-20 years, thus starting a new era of private, competitively priced space travel and exploration. The developments in space made by private companies, not governments, will usher in a new era of human exploration and expansion throughout the known universe.